Often times a band’s debut EP can prove transparent, betraying their calculated vision and the shared influence that musically galvanized the members in the first place. This can be especially problematic, as fledgling bands have a propensity to aggregate songs over time, reinforcing their live set until a recording seems warranted, at which point the touchstone influences cited in their oldest songs can seem a bit dusty. 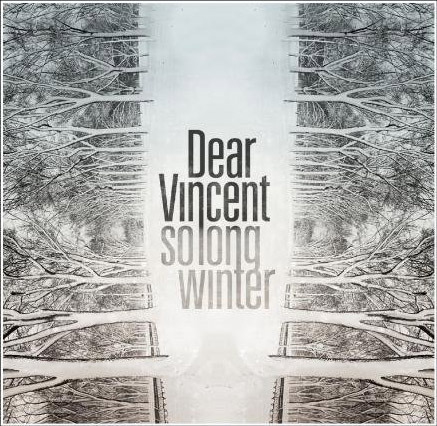 Dear Vincent don’t so much side-step this obstacle as render it irrelevant, solely by busting up any notion of “trend” with out-and-out quality. It also doesn’t hurt that they’re primarily mining the tried-and-true intersection of indie rock, folk, and the generous musical umbrella that is “Americana”, and again, doing it really, really well. So Long Winter displays the band’s meticulous approach to utilizing the details at it’s very outset, with the opening of “Epitaph” offering an airy organ drone and softy arpeggiated guitar, punctuated beautifully by staccato vocal hums dissolving into the reverb. Sure, there are the potentially questionable sea shanty detours, gypsy band flourishes, and the by-now passé sprinklings of glockenspiel, but the unrelenting motif is quality songwriting swathed in perfectly manicured musical arrangements. Singer Bryan Steel’s voice is as crisp and solemnly lilting as the images his lyrics evoke, while the band heels perfectly to his tone, waning to a simmer with his pensiveness and introspection, and then building to a pounding bombast with his more powerful laments. Musical trends come and go so quickly nowadays that the relevance of a particular band’s sound can come and go before anything has even been “put to tape”. Short shelf-lifes belie gimmicks and sophomore slumps shed light on freshman flukes. The only real way to sustain any kind of musical career is to begin with the same solid foundation that has worked for everyone who has ever enjoyed continued relevance in the music world: Good songs. Steel & Co. seem to have no problem unearthing these with marked consistency, so barring any ill-advised dabbling in no-fi or coolwave, Dear Vincent should enjoy a successful run no matter what sonic weather the musical climate of the moment offers.